قربانی سرباز – Pawn Sacrifice محصول سال ۲۰۱۵ کشور آمریکا فیلمی دیدنی به کارگردانی Edward Zwick در ژانر بیوگرافی (زندگینامه) و درام است که وجهه دیگری از بازی شطرنج را با بیان زندگی واقعی بابی فیشر، نابغه دنیای شطرنج از کودکی تا بزرگسالی نشان می‌دهد. قربانی سرباز فیلی خوش ساخت و تاثیرگذار است که فلسفه بازی شطرنج را در موازات جنگ دو کشور ابر قدرت جهان به چالش می‌کشد. 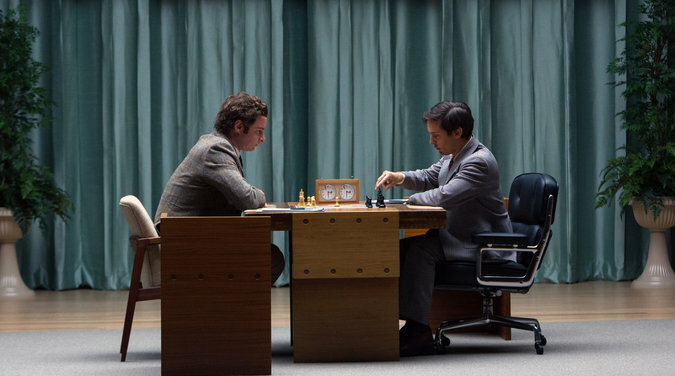 Although Edward Zwick’s “Pawn Sacrifice” has the great virtue of centering on expert performances by a cast including Tobey Maguire, Liev Schreiber and Peter Sarsgaard, it ends up as a sad example of the inherent difficulties of dramatizing a cerebral face-off like the 1972 battle royale between chess masters Bobby Fischer and Boris Spassky. No doubt the subject here could make for a strong film. It certainly did in “Bobby Fischer Against the World,” Liz Garbus’ justly acclaimed 2011 nonfiction account of the same material. The latest proof that some real-life incidents come across more dramatically when treated as documentaries rather than fact-based fiction, Zwick’s film effectively poses the question of why viewers should care about a chess match that riveted the world more than 40 years ago. The answer to that may well depend on the viewer’s age. Zwick includes generous dollops from the U.S. network news coverage of the Fischer-Spassky confrontation in Reykjavik, Iceland, footage that will perhaps carry a nostalgic charge for baby boomers who recall how the match was treated not just as a sports event but as a symbolic showdown between the ideologies represented by the U.S. and the Soviet Union. For filmgoers too young to remember the fraught tensions of the Cold War, however, these same antique newsreels may seem like little more than dimensionless historical curiosities. In rather formulaic fashion, Steven Knight’s screenplay starts off with certain tense moments before the big game begins, then flashes back to show how the characters got there. The result is that the film’s first hour is devoted to a biopic-style chronicle of Fischer’s early life, in which we learn that Bobby (played as a youngster by Aiden Lovekamp and Seamus Davey-Fitzpatrick) had a loose-cannon Communist mom (Robin Weigert) who refused to tell him who his real dad was, but established his chess skills early under the tutelage of a generous mentor named Carmine Nigro (Conrad Pla). One of the jarring oddities of this section of the film is that it’s supposed to take place in New York, but when we see an al fresco chess rendezvous that’s labeled “Washington Square Park,” it is transparently NOT that world-famous location. Sure, we know that budgetary constraints oblige many U.S.-set films to shoot in Canada, but then why not leave out the label and allow viewers to assume that this is some other park? In any case, Montreal here plays not only New York but, even more improbably, Santa Monica. The latter city is where Fischer (now played by Maguire) has his first battle with Russian chess ace Spassky (Schreiber). Prior to this, we’ve seen how the brash young prodigy has already emerged as a media celebrity and forged a precocious career path with the help of lawyer Paul Marshall (Michael Stuhlbarg) and Catholic priest William Lombardy (Sarsgaard), a chess master who served as his teacher. As he does throughout, Zwick treats Fischer’s late-60s trip to California with all manner of cinematic clichés: We see oodles of grainy footage of surfers and their chicks on the beach and other flashes of the sun ‘n’ fun lifestyle, not that this has anything to do with the chess competition that takes place entirely indoors. Most annoyingly, the filmmakers lamely try to conjure the era by repeatedly blasting period rock ‘n’ roll hits on the soundtrack. Even fans of this music are likely to concur that it has been used for such purposes far too often in movies. In any case, gobs of musical pep do nothing to make the slow and arcane processes of chess more accessible. Rather oddly, Zwick doesn’t even show the Santa Monica match between Fischer and Spassky. We simply see the result, which has the feel of dramatic contrivance: Fischer, the loser, screams inchoately as his puzzled nemesis emerges from an early morning swim in the ocean. Once the scene switches to Iceland in the film’s second hour, we’ve clearly gotten the message that Fischer is a nut job. But filmgoers are likely to consider this a blessing since it accounts for much of what entertainment value the climactic match holds. Even if we don’t care that Richard Nixon and Henry Kissinger are watching in the White House (among countless nudges we’re given as to the event’s geopolitical significance), and despite the unavoidably truncated and opaque way the games are presented, there’s some amusement in seeing Fischer insisting that the play be moved to a small rec room away from the big hall’s noises and distractions, a bit of craziness that eventually unhinges the favored Spassky. By this time in his life, Fischer (who was Jewish) was already into the anti-Semitic conspiracy theories that marred his public persona long after his days in the sports limelight had waned. While Zwick and company do nothing to explain this bizarre mania, “Pawn Sacrifice” definitely conjures the feeling of it, thanks in large part to the movie’s greatest asset: Maguire’s edgy, charismatic performance. The director Edward Zwick is, with all due respect, a master of the formulaic true story. Many of his best-known works—Glory, The Last Samurai, and Love and Other Drugs—are biopics of one kind or another, telling inspirational and dramatic tales of history crammed into neat three-act plot structures. 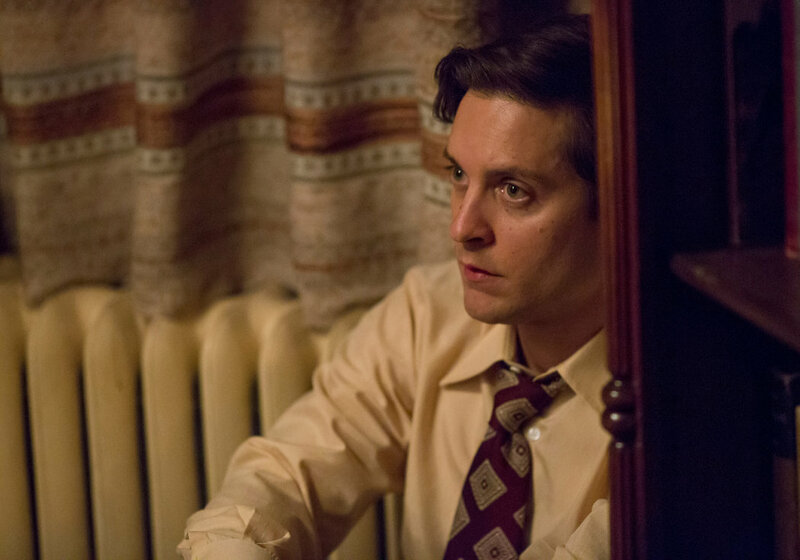 With his latest film, Pawn Sacrifice, Zwick encounters his greatest challenge yet: trying to fit the life of the publicly paranoid, narcissistic chess genius Bobby Fischer (Tobey Maguire) into the most straightforward narrative possible. Like all of Zwick’s works, it’s perfectly watchable fare, but it’s often infuriating for its refusal to dig deeper into its incredibly compelling subject. Which Bobby Fischer Should We Remember? Pawn Sacrifice hits all of the grace notes of the biopic genre. Viewers see Fischer as a child, raised by a socialist, Jewish single mother (Robin Weigert) whose views he’d later rebel against. He takes to chess at a young age and blasts to stardom, becoming the U.S. champion in his teens and by his mid-20s turning his eye toward the World Championship, held by the enigmatic Boris Spassky (Liev Schreiber). The famed Fischer-Spassky match is the narrative crux of the film—it’s both Fischer’s greatest triumph and the beginning of his public meltdowns, which ruined his career and eventually saw him exiled from the United States. Zwick doesn’t want to shy away from this part of Fischer’s life, but he also has no idea how to engage with it meaningfully, which hobbles the film’s ambitions. Maguire, who is 40, still has the baby face to play Fischer, and he does just fine with the role. It’s perhaps a backhanded compliment to say the A-list actor excels at playing jerks, but that’s Maguire’s forte these days—the unhinged, the prickly, the malcontented. Though he’s rarely acted since leaving the Spider-Man franchise, he did especially strong work in 2009’s Brothers as an unstable military veteran and in 2013’s The Great Gatsby as a particularly neurotic Nick Carraway. His Fischer is an irascible pain, in a weirdly charming sort of way. He tells everyone what he thinks of them to their face, brazenly raves about his own genius, and barks non sequiturs in a Brooklyn accent at his closest friends, a patriotic lawyer named Paul Marshall (Michael Stuhlbarg) and his fellow chess player William Lombardy (Peter Sarsgaard), as they try and coax him toward the 1972 World Chess Championship. It may be impossible to know just why Fischer became so troubled, but Pawn Sacrifice doesn’t offer any theories. It’s pretty quickly obvious that Fischer isn’t an average genius with a few foibles. He’s a dangerously paranoid man who spouts anti-Semitic views at random and is convinced both the FBI and KGB are spying on him. Zwick tries to some extent to get at the maddening conflict between Fischer’s chess genius and his mental illness, but Pawn Sacrifice always keeps its subject at arm’s length. Most of the plot follows Lombardy and Marshall trying to lure Fischer out of hotel rooms and guest houses so that he can play Spassky, treating him like a dangerous alley cat who could go wild at any moment, but never finding substance beneath that frustration. It may be impossible to know just why Fischer became so troubled, but Pawn Sacrifice doesn’t try to offer any theories beyond some garden-variety mother issues. It doesn’t help either that chess is a tough sport to dramatize, although there have been films that capture the electricity of watching such a battle of wills unfold, like Steven Zaillian’s 1993 great Searching for Bobby Fischer (which actually had nothing to do with Fischer himself, but rather the fruitless hunt for his successor). Fischer’s matches with Spassky were some of the most significant in the history of chess, but Zwick chooses to dwell instead on his exasperating tics (loudly objecting to audience noise and creaking chairs). Schreiber gives Spassky burly, threatening physicality, but doesn’t get much else to do except growl some lines in Russian. Really, it doesn’t feel like Pawn Sacrifice hits its stride until it cuts to black at the end and displays some title cards explaining what happened to Fischer after the notorious match. Zwick loves a meaty story, but he wants to tell it as simply as possible. When he’s dealing with heroes like Glory’s 54th Massachusetts Infantry, or Defiance’s Nazi-fighting Bielski partisans, that’s easier to pull off. But with a protagonist as difficult and fascinating as Bobby Fischer, it’s too short an order. It was a challenge to play Bobby Fischer in chess, and it’s a challenge for an actor to play him on the screen. Anyone taking on the task needs to be careful not to get carried away with the man’s eccentricities, to make sure to retain the pathos beneath the sideshow. Tobey Maguire meets that challenge adroitly in “Pawn Sacrifice,” a film by Edward Zwick about Fischer’s chess match against the Soviet grandmaster Boris Spassky. His character is infuriating — “Just play the game, already,” you want to shout at the screen as Fischer’s real and imagined demons cause him to disrupt the match. Yet you regret succumbing to that feeling because you know intellectually that the guy is not being merely petulant. The Fischer-Spassky match in the summer of 1972 took place, of course, during the Cold War, with the title of world champion at stake. Chess was a game the Soviets owned, but Fischer had been a force to be reckoned with since he was a child. The film gives a sketch of Fischer’s youth, hitting just enough of it to link his future paranoia to mommy issues. (Robin Weigert plays his mother, Regina; Lily Rabe is his sister, Joan.) This section of the film feels a little pat, but it at least helps set up the coming political dynamics, Regina having been under the F.B.I.’s watchful eye for suspected Communist sympathies. The match, which was played in Iceland, was a classic pre-Internet media circus, and the film efficiently captures the bombast it inspired in the United States, not to mention the chess mania. Liev Schreiber has an impossible job as Spassky, thanks to too many comedians who have created too many caricatures built on taciturn, tanklike Russians and East Europeans; he seems like a caricature himself. But the focus is on Fischer, and Mr. Maguire, though not as imposing as the 6-foot-1 Fischer, is certainly as unpredictable. Fischer put all sorts of demands on the organizers of the match and skipped one game entirely. The film doesn’t delve into his life after the match, in which he forfeited his title; became known for incendiary remarks, especially about Judaism and Israel; and ultimately faded into obscurity before his death in 2008. But Mr. Maguire certainly shows us the beginnings of all that and gives us a man who, while a great chess player, was poorly suited to become the central figure in a Cold War carnival. He was clearly beginning to melt down during this high-profile moment in time, with his coach, a chess-playing priest named Bill Lombardy (nicely portrayed by Peter Sarsgaard), shouldering much of the burden of keeping him on track. Pity any ardent chess fans who go to this movie; they’ll be pounding the walls over the differences between Mr. Zwick’s depiction and reality, and will no doubt be irked that the film doesn’t dwell much on the actual chess playing. But this isn’t a chess movie, it isn’t a biopic, and it isn’t a documentary. (For that, see “Bobby Fischer Against the World,” a very good 2011 treatment from HBO.) It’s a dramatization, one aimed at a general audience. And, ultimately, it is only partly about Bobby Fischer. It is equally about us — Americans or any other nationality inclined to put too much importance on chess matches, soccer matches, space races, whatever. It’s about how we manufacture celebrities on scant pretext and then destroy them, or allow them to destroy themselves while we watch. “Pawn Sacrifice” is rated PG-13 (Parents strongly cautioned) for a hint of sexuality and a smattering of strong language. Oh, and cigarette smoke.